Norm brushed dust off his shirt. Norm swung around and gasped. The castle had disappeared again, leaving them in a field containing a geodesic dome. “So far Iona’s magic fails sent the castle to Sleeping Giant State Park in Hamden, Harkness Memorial State Park in Waterford, and this place,” Thomas observed. Norm suddenly felt a strange tingling emitting from the direction of the dome. “Feel what?” Thomas paced, pretend smoking the pipe as he imagined Sherlock Holmes would do while pondering clues in a case. But Thomas had already resumed his pacing. “If I were Gillette Castle, where would I go next?” he muttered. His deductive musings were interrupted by a loud humming noise coming from the dome. “Now do you feel it?” Norm said. His hair – or what was left of it – stood on end. Without warning, the briarwood pipe was sucked out from Thomas’ mouth. It flew in the direction in the dome, narrowly missing Norm’s nose, closely followed by the deerstalker, which was swept off Thomas’ head by the invisible force. The humming noise became unbearably loud, twinned with eardrum-busting vibrations. “I…think…there…ISSSSS,” Norm screamed as his legs finally gave into the strength of the force field and he found himself flying toward the dome at high speed. “Not GOOOOOOOOOOD!” Thomas yelled as he, too, was sucked into the force field and started zooming through the air against his will toward an uncertain fate. It looked like their plan to rescue Li-Ming was going to have to be put on hold. Li-Ming stared at the closet wall. The hidden door must have closed when the castle moved, and now she was trapped – and alone. 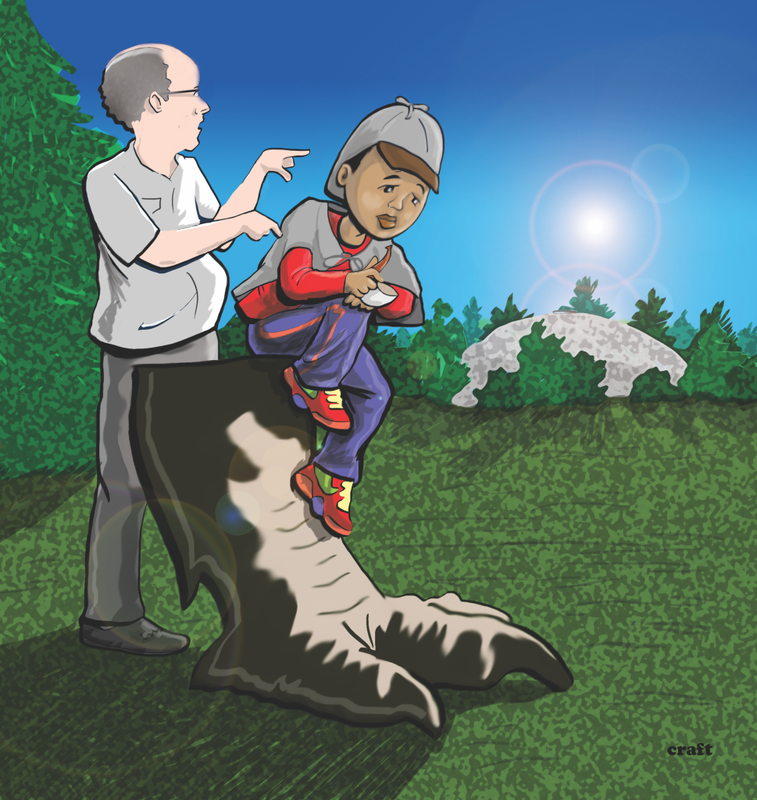 Thomas and Norm were back at Dinosaur State Park and she was now stuck at an undetermined location with two newbie wizards trying to transport one of Connecticut’s state treasures back to Scotland for Lady Something or Other. Not your average school field trip, she thought. She pushed open the closet door slightly and listened. No more velociraptor skeleton noises. No Iona and Jasper either. But Li-Ming did hear another sound coming from the room outside the closet door. Li-Ming crept out of the closet. Sitting on the bed were two frogs. “Ribbit!” croaked the bigger frog. “Ribbit, Ribbit!” replied the smaller frog. Li-Ming remembered that as well as his seventeen cats, William Gillette had two pet frogs, Mike and Lena. She wondered if these two were their descendants. She didn’t have much time to wonder, because just then there was an explosion of white light and the bedroom door flew open. Iona stood in the doorway, her wand pointed directly at Li-Ming. Thomas muses, “If I were Gillette Castle, where would I go next?” Based upon events in the story thus far, what deduction can you make in response to this question? Who or what do you think is behind the force field that sends Norm and Thomas zooming through the air? Where do you think it will take them? Given what they have experienced in the story so far, should they be worried? Does the last line of this chapter remind you of another fictional story? What does the phrase, “my pretty,” suggest about Iona’s motives? Should Li-Ming be nervous ?